Museums don’t always thrill me, with their guards and heavy silence and collections of objects trapped lifeless behind glass. But I was pleasantly moved and surprised by a visit to Kansas City’s World War I Museum during a recent trip to my hometown. Housed in the Liberty Memorial, this is the only museum in the U.S. dedicated solely to World War I. Featuring exhibits and interactive displays that engage all senses, the facility appeals to history buffs and those who aren’t so enamored with conflicts and hard-to-remember timelines (like myself). I always enjoyed living history, oral history and first-hand accounts that told individual stories. Primary resources like diaries and letters speak to me and I like candid photos, music and letters that describe the laughter, love and pain absent from textbooks. A collection of envelopes that had encased letters from a father on the front to his son in San Antonio caught my attention. 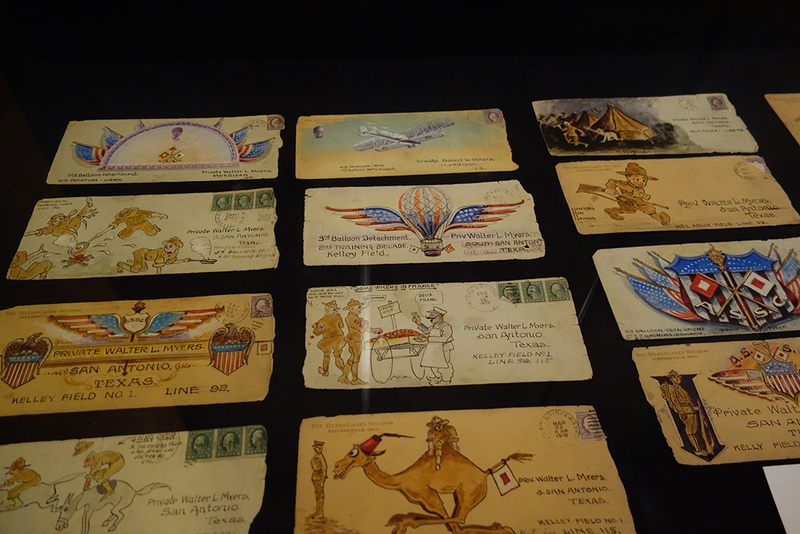 Skillfully drawn and addressed to Private Walter L. Myers, these miniature works range from comical to patriotic and capture remarkable everyday experiences, from one soldier to another. The sketches carry a message through time and space, so that a century later we understand at first glance. Connection in the face of conflict. Textbooks document the dates and timelines, victories and losses, nationalities, maps, destruction and casualties. But a comical sketch sent from “somewhere in France” or a photo of the artist drawing in a distant combat zone soars above boundaries like the hot air balloons depicted by Myers, an artillery scout. It doesn’t matter if the soldier is French, American, German or Russian – he’s a man and a father, far away from home. After touring the museum, I visited the post office and bought 2 books of “vintage seed package” stamps. I haven’t written to my daughters in awhile – maybe I’ll get out the colored pencils today and get drawing.